Adidas NMD Racer Primeknit - To Buy or Not in Apr 2019? The Adidas NMD line prioritizes comfort, flexibility, and minimalistic style above all other features, and their Racer Primeknit model is no exception. 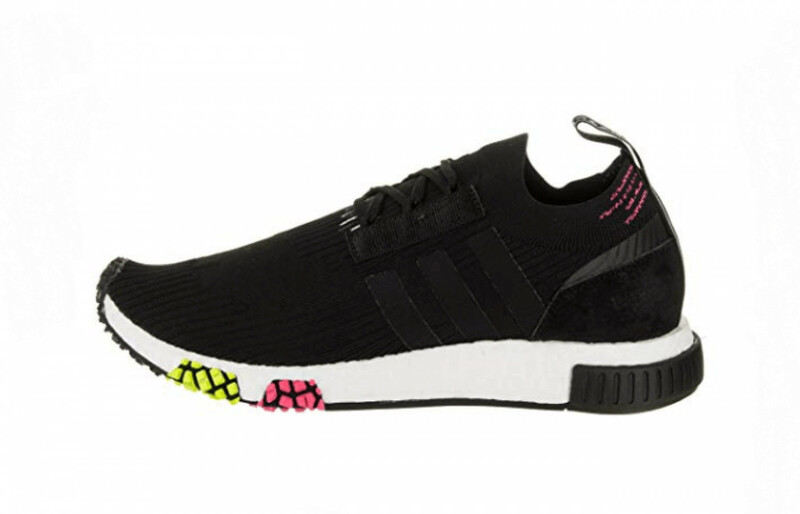 Because this shoe is not equipped with many of the same features as other NMD designs and has not been on the market as long as Adidas’s other casual shoes, this is not exactly a best-selling item. Therefore, a limited amount of online information and reviews are given about this shoe’s specific details. Still, its level of comfort and flexibility have earned it several positive reviews. Of course, the high price tag may or may not be worth it depending on how often the buyer intends on wearing them. The NMD Racer features a flexible yet durable rubber outsole with a repeating hexagon pattern throughout much of its length. A two-toned neon tread in yellow and bright pink, featuring a textured cobblestone-like pattern, is placed along the ball and toe area. Though this particular shoe is not meant to be worn on rough terrains or used repeatedly for heavy athletic activity, its outsole still provides incredible traction for everyday wear in both rain and shine. 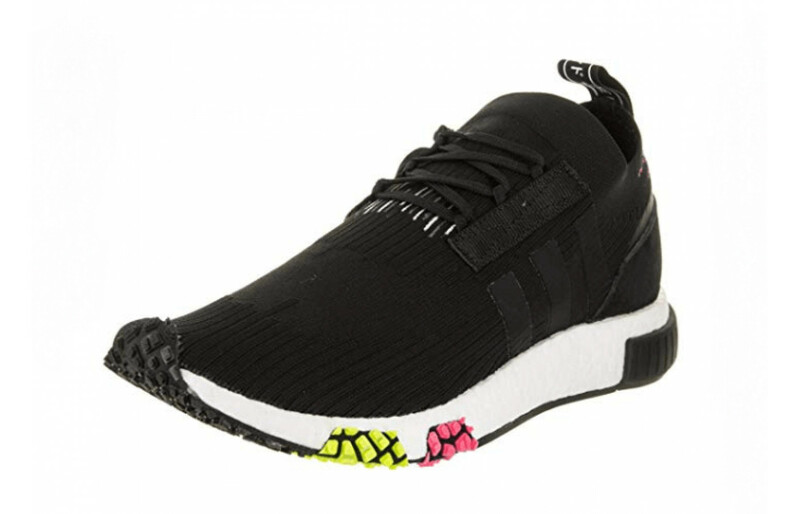 Though several Amazon listings claim this NMD Racer is equipped with an EVA Foam midsole, this is false information. Instead, this feature is crafted with the more recent and much more durable Boost technology. Not only is it more resistant to higher temperatures, but it also ensures the highest energy return possible out of any midsole material. Since swapping out EVA Foam for Boost in their more recent designs, loyal Adidas fans have noticed an incredible difference in both their comfort levels and the bounce in each of their steps. All this said, Adidas has still included EVA heel plugs into this shoe's midsole for added cushioning and shock absorption. As suggested by the name, this model’s Primeknit upper is its signature feature. This breathable, sock-like material is a standard for several Adidas brand casual models. A noticeable difference from other NMD models, and even other Adidas designs, is that this particular Primeknit is much stretchier. This, along with the already attached tongue, makes for a surprisingly comfortable sock-like fit and super easy foot insertion without much need for tightening of the laces. Consumers would find this ideal for making emergency trips or running errands. Little to no online information is given about how much the NMD Racer weighs. But based on its materials, and the weight of the package, it can be determined that this model is extremely lightweight when compared to most casual running shoes. Between the Primeknit upper, Boost midsole, and lightweight rubber outsole, one shoe alone is estimated to weigh no more than two pounds. This makes it the perfect size to maintain comfort during casual runs. Primeknit is an extremely popular material for many of Adidas’s casual running shoes, and it is known for being extremely breathable. So when it came to designing a casual yet stylish everyday shoe, this material was the obvious choice the NMD line, especially with their Racer model. Sweat can easily be dried away, reducing not only foot odor, but also the likelihood of annoying rashes and infections. This, of course, would also make these quite comfortable during warmer weather. It goes without saying that comfort is the NMD Racer’s biggest selling point. Its Primeknit upper offers a breathable sock-like fit, and its Boost midsole cushions the foot throughout the day while providing the best possible shock absorption for any Adidas shoe. It is also the first model of the NMD line to be equipped with an arch plate, ensuring a more comfortable stride for those in need of additional arch support. Multiple reviewers have suggested sizing down, however, as their normal size runs a bit too wide. This is mainly due to the attached tongue and, therefore, the limited amount of security offered by its laces. Adidas has never been one to skip out on style for any of its products, crafting a signature look for many decades. And the NMD Racer Primeknits are no exception when it comes to fashion, described online as the perfect blend of the brand’s classic 80’s design and a futuristic flair. Its Primeknit upper is decked out with subtle gradient embroidery along the heel and vamp, and a color-matching suede panel is placed at the heel. 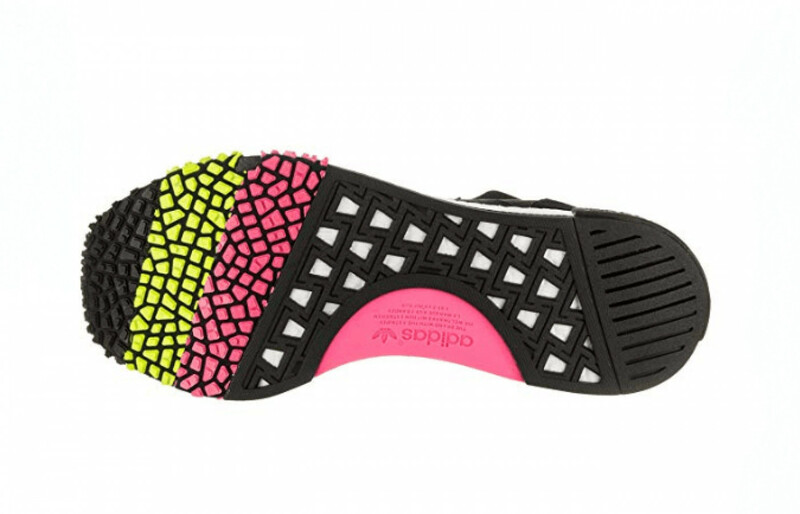 This cool monotone look is contrasted by neon pink and yellow accents on the shoe’s outsole. Compared to similar Adidas models, these come in a more limited variety of colors. Black, grey, white, and pink are available in both men’s and women’s sizes. A light blue option is available only in women’s sizes. A serious downside to the NMD Racer’s Primeknit upper is its lack of durability. As this shoe is not intended for a rigorous activity, sturdier materials were not used or considered when designing this model. Several reviews do suggest, however, that its rubber outsole can hold up well after many months of running and walking. And its Boost midsole is surprisingly resistant not only to higher temperatures, but also to extensive wear. That said, this is still more a casual running shoe and is not recommended for heavy athletic usage. Yet another disadvantage for the NMD Racers is that their Primeknit upper offers little to no real foot protection. Though its breathability can offer some protection from rashes and infection caused by excessive foot sweating, it is limited when it comes to defending the runner against the elements. That said, the rubber outsole has proven to be quite sturdy, and its Boost midsole and EVA heel plugs offer incredible protection when it comes to foot impact. Compared to other Adidas models that rely solely on EVA Foam, the NMD Racer’s Boost midsole offers incredibly high levels of energy return for the runner. This, of course, is aided further by the addition of EVA heel plugs, aiding the runner in transitioning their movements from slow to fast to slow again without impacting the feet, legs, and back. In addition, this shoes Primeknit upper gives an incredible, sock-like fit that allows for the most natural range of motion possible, and its rubber outsole offers surprisingly flexible stability. Though not much information is given about the NMD Racer’s support features, it can be estimated that there is not much to be offered on this model when compared to many other Adidas shoes. Its Boost midsole and EVA heel plugs do an incredible job at offering shock absorption, and its built-in arch plate is said to fair very well for those with flat feet. That said, those with foot conditions would be wise to search for another option. Though there is no online recommendation for usage, it’s safe to say that the NMD Racers were not constructed to withstand rough terrains. These are an everyday casual shoe, meaning that they are only meant for terrains you would find in the city or suburbs. Still, the outsole has proven to be durable after months of heavy usage, and the rubber material also allows for safe movement on wet ground. The NMD Racer Primeknits are definitely on the more expensive side when it comes to pricing. And considering this model’s noticeable lack of special features, it may not be worth it to many consumers. On the Adidas website, it is listed at $180. Other online retailers such as eBay and ASOS have the price set anywhere between $140 and $170. Several Amazon listings do have this model set for much cheaper, however, yet it is still a wise decision to check all reviews in order to avoid buying a bootleg product. For a casual running shoe that did not take rough terrains into account during its design period, the NMD Racer’s traction is quite superb for everyday settings. Its rubber material ensures a firm grip while running on wet or dry streets and sidewalks. Still, considering the lack of durability within the rest of the shoe, it’s best to not use these for heavy athletics more than once in a while. One big advantage of having a knit upper is its ability to allow the runner full range of motion, so it’s no surprise that this has become one of the NMD Racer’s major selling points. This breathable, stretchy material combined with the lightweight Boost midsole gives the runner the best range of motion possible. And its rubber outsole provides just enough support while still remaining pliable, allowing for unrestricted movement during errands, a day of sightseeing, or a light run or workout session. With so much emphasis placed on comfort and flexibility, it shouldn’t come as a surprise to learn that the NMD Racers don’t offer much in terms of stability. 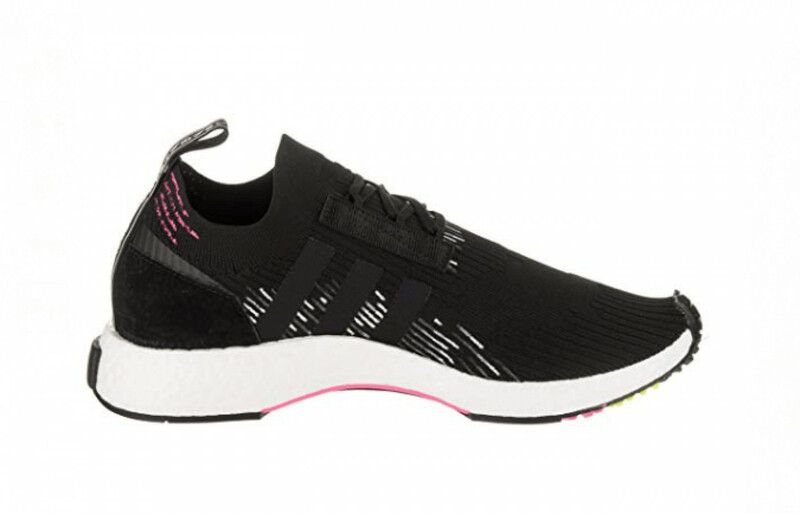 Even though the rubber outsole provides a stable foundation for the wearer to move around in, and the Boost midsole adds to this by providing sturdy cushioning, its otherwise lightweight materials can add nothing else. Those with conditions such as pronation, plantar fasciitis, or badly collapsed arches are better off searching for another shoe. As with its weight and support features, there is no online information given about the NMD Racer’s drop. However, images do show a noticeable height difference in the platform between the heel and toes. Consumers who prefer their running shoes with extra heel support, as opposed to a zero-drop platform and more natural stride, would be quite satisfied with this model. The Adidas NMD Racer Primeknit is by no means a best selling item. Runners looking for a durable athletic shoe would be sorely disappointed by these. And they have not been on the market for nearly as long as other casual running shoes, like the Adidas Swift Run. Furthermore, many consumers see their high price tag as nothing more than a deterrent, considering how little support and durability it offers in return. Still, for those in need of a reliable everyday sneaker that can provide hours of comfort and the most natural range of motion possible, these would definitely be well worth the cost and are sure to become a staple for their day to day casual wear.